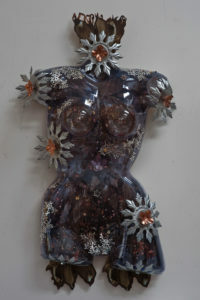 “Alchemy” is largely made of plastic, resin, metal (tin, copper, silver, gold leaf), wood, glass beads, coral, photographic collage and die cuts with an orchid blossom in the center. I made a few updates on her since her show at Lyfe Yoga Gallery in Huntington Beach. 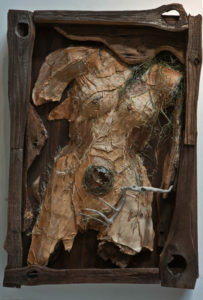 “Nesting” is mainly made of wood, plastic, eucalyptus bark, glass beads and maple seeds. The rest of my time has been on finishing my first book titled “(She has a….) Penchant for Passion”, a coffee table book of poetry and artwork. If my readers are interested in being informed on dates for the opening celebration for the book, please send an email. Thanks to all who have supported and continue to support my artistic endeavors. I look forward to seeing your smiling faces at the Brewery Artwalk!!! !